Before I begin this review, I have a confession to make: I never played with GI Joe as a kid. I was a big He-Man fan, and Transformers after that, but I was never drawn to GI Joe. Perhaps my little hands were too full with Transformers; perhaps, even as a tyke, I had a healthy mistrust of the military-industrial complex. Whatever the reason, I have no boyhood nostalgia regarding GI Joe. I was aware of him, and had several cousins and friends with loads of the toys, but I was always happier in the fantasy and science fiction realms than the "real world" of GI Joe. My detachment arguably makes me a good reviewer of Hasbro's newly-revamped 3¾" GI Joe line, as my review will be unbiased. However, I will try to be sympathetic to Joe fans in writing this review. For those who don't know, Hasbro has not only re-released many of the original 3¾" GI Joe figures from the 1980s, but they've also produced an all-new line that updates the old characters with McFarlane Age sensibilities (much as they have done with the Star Wars: Power of the Force line). This is in keeping with the current trend of reviving '80s properties (such as Hasbro's own Robots in Disguise update of Transformers and Mattel's revamped Masters of the Universe line). 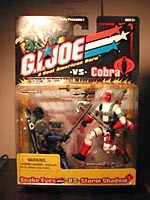 Like the re-releases, the revamped line is sold in two-packs - one Joe versus one Cobra. I chose the Snake-Eyes/Storm Shadow pack, as I had always found Snake-Eyes to be the only interesting Joe. The packaging isn't too interesting. Black background, and the back has a number of cool comicbook-style pictures of the characters. I'll call the packaging collector-friendly because the figures are in something of an action pose, facing off against one another with weapons in hand, so the toys look dynamic even if they're mounted mint-on-card. The toys do come with mini-bios, but they're hidden inside the packaging. Hasbro must have had to conserve space, and they deem it more important for kids to know what other toys they can buy rather than what they're currently buying. One of the more controversial aspects of the new figures was Hasbro's decision to remove the infamous "O-ring" - the rubberband that held the old figures' legs on. While the O-ring was prone to breaking after too much use, it acted like a balljoint, allowing each Joe a large range of leg movement. The new figures have only a T-crotch like their POTF counterparts. With that exception, they have all the other articulation of the old figures - balljoint head, balljoint shoulders, mid-bicep articulation, waist, elbows and knees. Even in this day and age, 12 points of articulation on a 3¾" figure is quite good, particularly when three of them are balljoints. It's certainly an improvement over the Star Wars figures - probably because the POTF figures are becoming more and more geared toward the collectors' market, while the new Joes are intended as much for play as they are for collecting. The play value is what attracted me to these figures - that and the bright colors. I'm a sucker for brightly-colored figures with balljoints, which sometimes gets me into trouble. These are fun toys, with lots of accessories and good durability - these aren't likely to break without some serious effort. They're made of a more durable plastic than the original figures, and without the O-ring, the chance for breakage is slim. Any kid will immediately lose the guns and knives, of course, but that's to be expected. 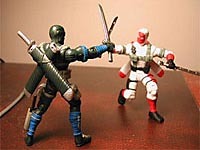 Speaking of which, both Snake-Eyes and Storm Shadow come with two swords, sheathes for the swords, a knife and a gun. Not bad. The sculpting, for this size, isn't bad, but it isn't great. Judging from the fantastic comicbook illustrations on the back of the package, I was expecting more - these aren't that much of an improvement over the original figures, unlike their PotF counterparts. But the sacrifices seems to have been made for the sake of play value. For instance, the twin sheathes on the back of each ninja are a bit oversized, but this is so the swords can actually fit. What does annoy me a bit is the fact that both figures have fingers that look posed to hold a gun properly, with a finger in the trigger guard, but the guns don't fit. Apparently the guns are just repros of old GI Joe weapons, rather than new sculpts. If you're a casual collector, I'm not sure how interesting you'll find these figures. I'm still a little ambivalent. I feel like Hasbro could have done a lot more with them. But if you're a diehard GI Joe fan, you'll probably find these pretty cool. The lack of an O-ring makes kicks look a lot less cool, but they make up for it with somewhat better sculpting and greater durability. Of course, the greatest asset the 3¾" scale has going for it is vehicles and playsets. If Hasbro gives fans (and kids) a lot of vehicles for these figures, then they may prove successful. If not, then I can't help but wonder if they wouldn't have had more luck by going with a larger size - let's say 6" - and giving us highly-articulated, well-sculpted figures of favorite characters.